occasionally, anyway. i went down to ny today, mostly for the interesting nyc conference and also partly to scope out a few galleries. i thought it would be a bit like sci foo (more here; yet more here), but interesting turned out to be mostly an ad industry event (at least, so it seemed): at the risk of throwing stones while living in a glass house, there were a couple of software presentations -- including one about php ("i just learned about recursion a few days ago!") -- at a level so low it was actually strenuous and a memorable talk in which the audience was characterised repeatedly as leviathans of cultural consumption and synthesis, each on the brink of cognitive self-destruction. the curve is a little disingenuous or, at least, does him a disservice in not clearly representing the point of the transition from pre- to post-materialism, which is that the process of transition changes the valence of the objects possessed. 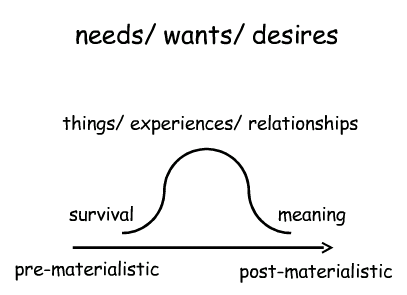 while pre- and post-materialist individuals could be at the same level of material possession, there's an ontological change in the meaning of the possessions -- they are elevated now such that, presumably, post-materialist man is happy with them where pre-materialist man was not. we see the same pattern in the weberian cycle of enchantment > rationalisation > re-enchantment (through the engines of bureaucracy and charisma). a re-enchanted sphere of life looks the same, but is dramatically different, is elevated from its origin state. 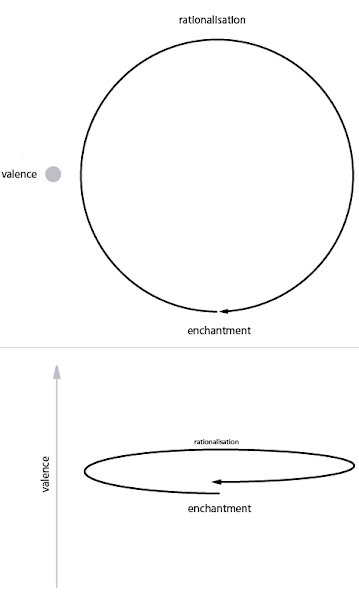 a curve describes only one dimension of the trajectory of the return to enchantment by way of rationalisation; the best way to show it is probably as a upward spiral that looks, from the top at least, like a circle. (click on the image for much clearer diagram.) obviously, this defies easy axial labeling.